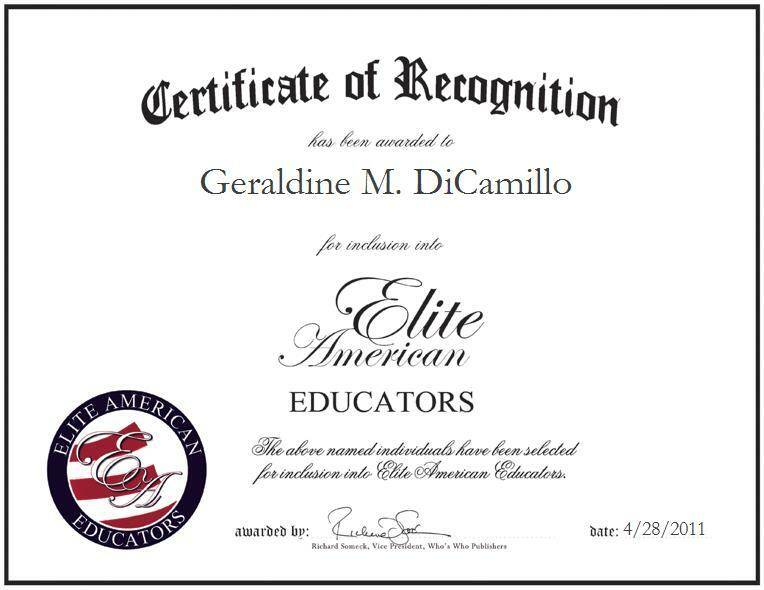 West Kingston, RI, April 28, 2011, Geraldine DiCamillo, Executive Administrator for the New England Division of the United States Professional Tennis Association, has been recognized by Elite American Educators for dedication, achievements and leadership in tennis training. Ever since she picked up a racket as a child, Ms. DiCamillo knew that her life would revolve around tennis. She continued playing while she attended the State University of New York at Cortland, where she earned a bachelor’s degree in physical education. Afterward, she began teaching physical education and coaching girls’ tennis at the high school level. Graduating from Ithaca College with a master’s degree, she started coaching tennis at the university level. With a desire to continue promoting tennis education, Ms. DiCamillo joined the New England Division of the United States Professional Tennis Association, where she has been its executive administrator for the past 18 years. In her position, she continues to coach and train tennis players as well as provides graphic design for four newsletters a year and convention brochures. She also acts as the liaison between the New England division and the world headquarters for the association. Inducted into her alma mater’s hall of fame in 2004, Ms. DiCamillo attributes her success to the upbringing she received from her family, the people she has worked with in the field, and enthusiasm she holds for what she does.